Modbus remote I/O module with RS485 Modbus/ RTU interface, 12 current sourcing outputs and 12 optically-isolated inputs. 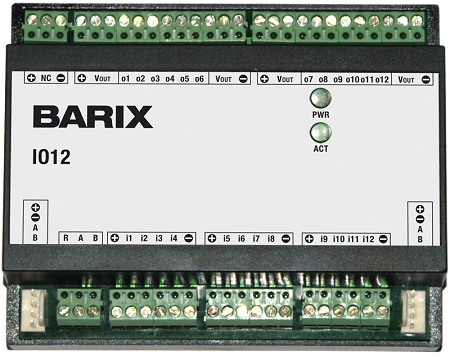 The Barix IO12 is a Modbus digital I/O module with a standard RS-485 Modbus/RTU interface. It provides 12 current sourcing outputs and 12 optically- isolated inputs that can be addressed using standard Modbus/RTU commands. 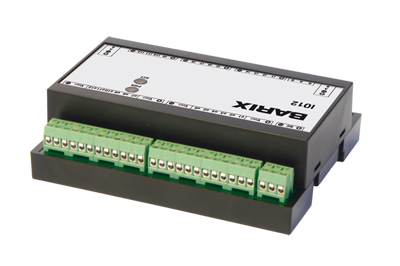 The IO12 can be used as a general-purpose Modbus I/O device or it can be interfaced to the Barionet using the Barionet’s built-in RS-485 interface and BCL code to implement the Modbus/RTU message protocol. 12 ESD-protected inputs, optically-isolated in groups of 4 with input current limiting.